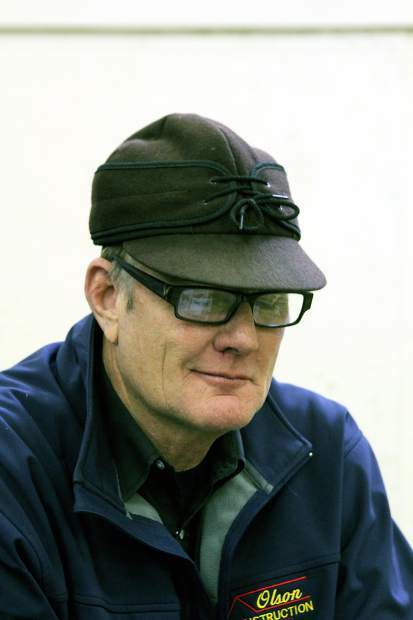 Repeat buyer Doug Doll, Hackamore Ranch, Ralph, S.D., purchased bulls again this year. 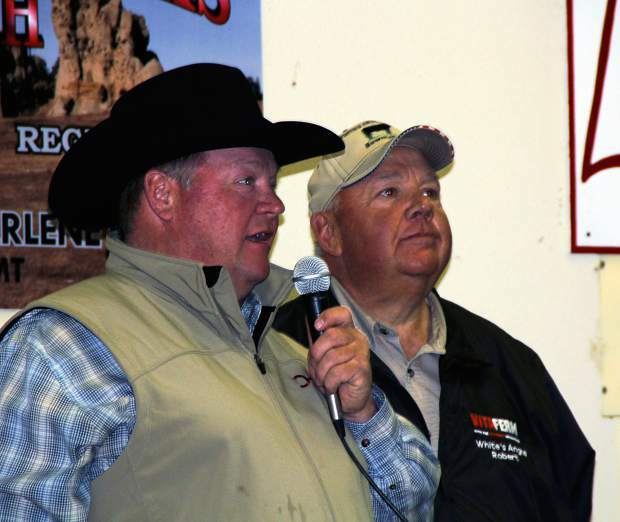 Sale hosts Raymond Lee and Robert White at the Annual Whiteâs Angus Ranch and Lee Angus Ranch bull sale. Robert White and Raymond Lee, along with their families teamed up again to present the annual White's Angus Ranch and Lee Angus Ranch production sale at Bowman Auction Market, in Bowman, North Dakota. These two operations compliment each other in the way they develop the bulls and in sire selection. The bulls were very uniform from top to bottom and were extremely well accepted by the large crowd of buyers in the seats, giving the White and Lee families the best sale they have had to date. Topping the sale was lot 35, Lees Bismarck 4149, a Mar. 19, 2014 son of SAV Bismarck 5682 that had a 205-day wt. of 768, ratio 109 and yearling wt. of 1307 pounds to ratio at 114. He posted epds of CED 8 BW 1.3 WW 58 YW 89 Milk 23. Gerald Streitz, Sentinel Butte, North Dakota was the winning bidder at $9,500. Selling at $8,750 was lot 14, Whites Big Harvest 427, a Mar. 28, 2014 son of SAV Record Harvest 2186 that had a weaning wt. of 758 pounds, to ratio 112, yearling wt. of 1,329 pounds, 111 ratio and epds of BW 5.1 WW 71 YW 132 Milk 33 Brian Jung, New England, North Dakota was the buyer. Pat Ruggles, New England, North Dakota got two bulls sired by SAV Record Harvest 2186 for $8,500 each. Lot 12, Whites Record Harvest 412, born Mar. 20, 2014 has epds of BW 4.2 WW 54 YW 100 Milk 27 and lot 13, Whites Record Harvest 435 born Mar. 21, 2014 has epds of BW 5.9 WW 63 YW 112 Milk 26. Lot 6, Whites Final Product 436, a Mar. 26, 2014 son of Connealy Final Product with epds of CED 9 BW -.7 WW 66 YW 112 Milk 33 sold to LeRoy Abrahamson, Bowman, North Dakota for $8,000. Also selling at $8,000 was Lees Windy 4133, a Mar. 13, 2014 son of Apex Windy 078 with epds of BW 3.6 WW 63 YW 99 Milk 29. Jeff Brown, Scranton, North Dakota was the buyer.